The monitor, one of the most crucial elements of a computer build, is evolving quickly. Samsung seem to be stepping up their game, with the announcement of curved gaming monitors. If you're looking to maximize your gaming experience, then this could be the monitor for you. The monitors will be available in 24-inch and 27-inch screen sizes. 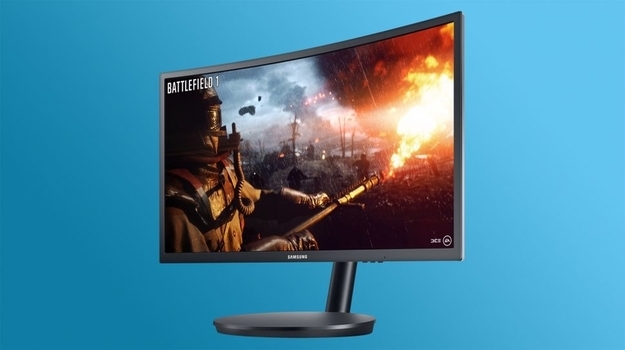 The Samsung CFG70 gaming monitors promise to deliver the best HD gaming experience possible, especially with their 1ms response time. There are plenty of monitors that refresh in 1ms - what makes these different? The CFG70 series are programmed to refresh the picture by dividing up the display into quarters, whereas most monitors refresh the entire screen at once. To compliment this feature and reduce flickering, the display also incorporates AMD's FreeSync technology to ensure the screen refresh rate is synchronized up to 144Hz. It doesn't stop there for the gaming monitor's impressive features. Samsung have also incorporated technology from their Super Ultra High-Definition TVs. By utilizing Samsung's Quantum Dot technology, the means the monitor will be able to display 125% of the sRGB spectrum, bringing greater depth to blacks and colors. As well as this, they will incorporate interactive LED "Arena Lighting" to provide a richer gaming experience by pulsing with the action. "As the gaming market continues to enjoy rapid worldwide growth, gamers expect advanced display technologies that can bring out the latest video game features and optimize the gameplay experience. By enhancing our pioneering curved gaming monitors with quantum dot technology, our CFG70 and CFG91 displays further surround players and make them feel as if they are part of the game. We are excited to demonstrate this futuristic and immersive gaming environment at IFA 2016." Another unique feature of this monitor is the base and stand. They've redesigned the whole mechanism. Rather than utilizing a traditional slide-and-lock stand, the CFG70 has a ball-and-joint assembly that allows the neck to seamlessly tilt, adjust height, rotate, and pivot, all without moving the base. These advanced gaming monitors will be available to purchase later in the year, although an exact date is yet to be announced. The 24-inch model will retail for $399 (about £300, AU$530) and the 27-inch model will go for $499 (about £380, AU$660). Will you be purchasing one of these monitors when they're released later in the year? Let us know in the comments below!